The Broken Frontier anthology unites over 50 of the most innovative talents in contemporary comics to share new visions of breaking boundaries and exploring the great unknown. From multiple award winners to the brightest up-and-coming voices, these creators have come together from all over the world to bring you 27 amazing stories about time travel, dystopian deserts, the edges of the universes, explorations into human mortality, and much much more. The full color, 312 page over-sized hardcover makes its print debut at Floating World Comics on March 23, 2016. On hand for the signing will be co-editor and author of the stories “Stranger Than Fiction” and “The Wall,” Tyler Chin-Tanner; cover artist Robbi Rodriguez; the creative team behind the story “Flyer,” Justin Zimmerman & Mike Lawrence. Floating World Comics was a retailer supporter of the Broken Frontier Kickstarter, so this will be the last chance to get Kickstarter exclusives from the campaign including prints of Robbi Rodriguez’s cover artwork and the limited edition book plates. 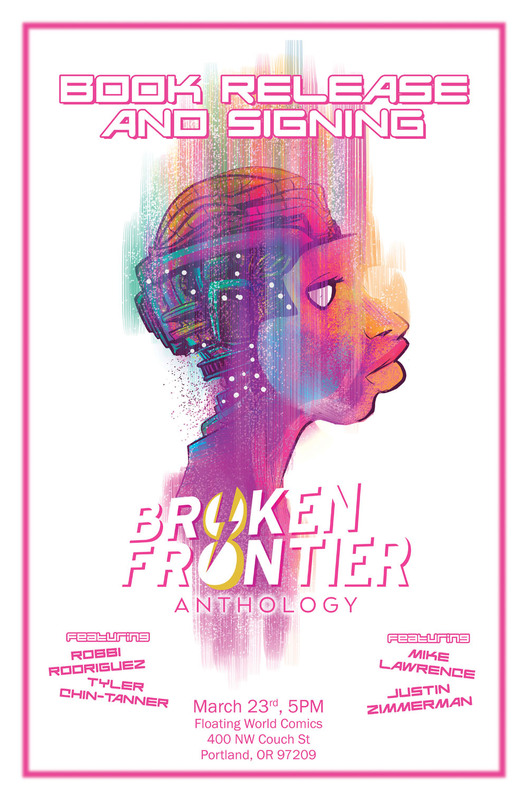 The print edition of the Broken Frontier Anthology is available at the A Wave Blue World webstore.